The Catla Catla or Catla Carp is a member of the Cyprinidae (carps) family which is indigenous to Northern India. The Catla Catla is found in various lakes and rivers in the Northern provinces of India it has been introduced to various countries throughout Asia including Thailand. This rarely caught and obscure Indian carp species has a broad pronounced head with a wide mouth and small upturned lower lip. The Catla Catla is covered with small dark silver to blue/ black plated scales and has a high raised dorsal surface with dark coloured fins and a large fork shaped caudal fin (tail). The Catla Catla or Indian Carp has been observed to cross breed with other cyprinid species such as Giant Siamese Carp in the captive environments of the fishing lakes of Thailand creating new hybridized strains of Asian monster carp sharing anatomical characteristics from each parent species. The Catla Catla or Indian Carp subsists on a varied diet of mollusks, zooplankton, insects and various other aquatic vegetation in its natural range of the wildest rivers in India. In the mighty Ganges River in India the Catla Catla is part of the staple diet of the Ganges River Dolphin. Very little scientific study has been carried out on this amazing freshwater species with little scientific information available about the Catla Catla or Indian Carp. 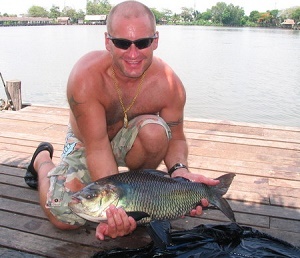 The Catla Catla or Indian Carp is a relatively rare capture whilst fishing in Thailand and although being present in various commercial fisheries throughout Thailand the shy and wily Catla Catla is not a regular visitor to the net. The Catla Catla is sometimes caught whilst fishing form other Asian carp species such as the Giant Siamese Carp or Rohu.